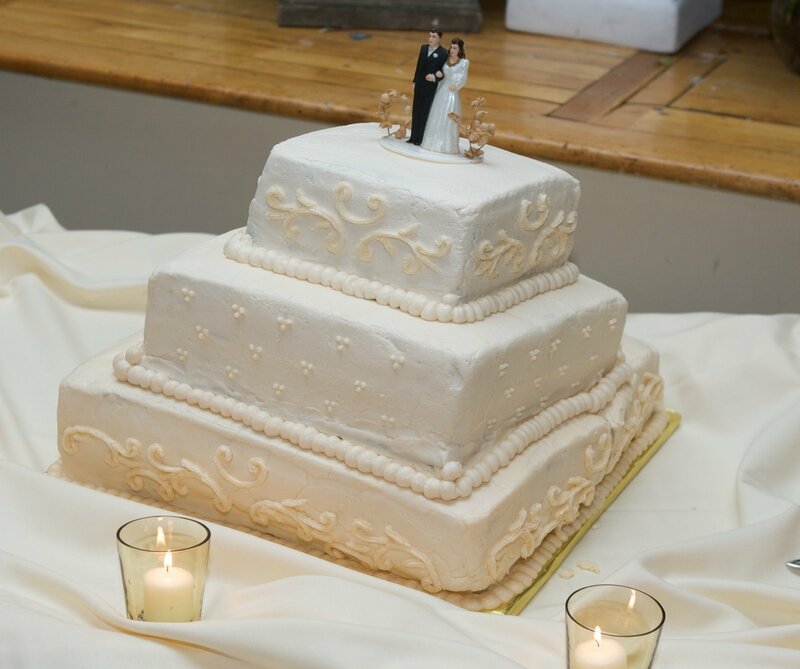 As you’ve probably heard, our wedding cake was, well, a disaster. I wrote about the whole thing here. I’ve been trying to decide whether our cake was worthy of submission to Cake Wrecks, one of my favorite things on the world wide web these days. Obviously the structural issues alone do not warrant Cake Wreck fame, but compare the decoration on our cake to the cake photos we gave the baker for inspiration– it just might be wreck-worthy. 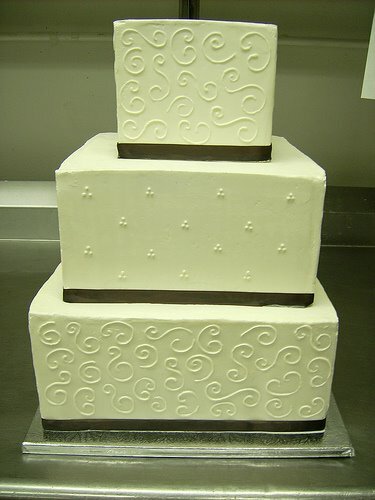 The idea behind the design was the alternating swirl-dot-swirl motif on the left, with the little frosting dots (seen in the cake on the right) along each tier. Simple. 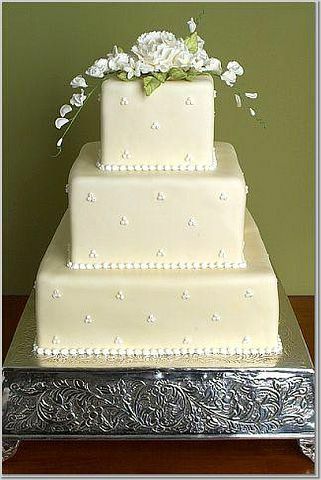 Those “dots” look an awful lot like mini marshmallows to me– and they don’t even continue around the entire cake! She just gave up. And yes, that’s cardboard showing. A nice touch. p.s. yes, after much back and forth, we got our money back. It doesn’t match today’s wrecktasticness, but yes, it’s a wreck. It wouldn’t be if it were just for the over-elaborate swirls: they just didn’t get the subtlety of the original. And at first I thought the blobbies weren’t TOO bad, until I saw the closeup. And the giveup. And the collapse. You didn’t drop it or anything? The cake collapsed like that of its own accord?For your tenth wedding anniversary you should bring the photo of the wreck to a bakery and try to get them to recreate THAT. definitely submit it. I think the cardboard showing and the incompleteness of the frosting “pearls” alone make it wrecktastic. I think it’s Wreck-worthy. Between the “structural issues” and the icing dots that didn’t go all the way around, this is definitely a Wreck!Just out of curiosity, did you get any money back from the “baker”? I followed you over here from wrecks – and you SO should submit that! 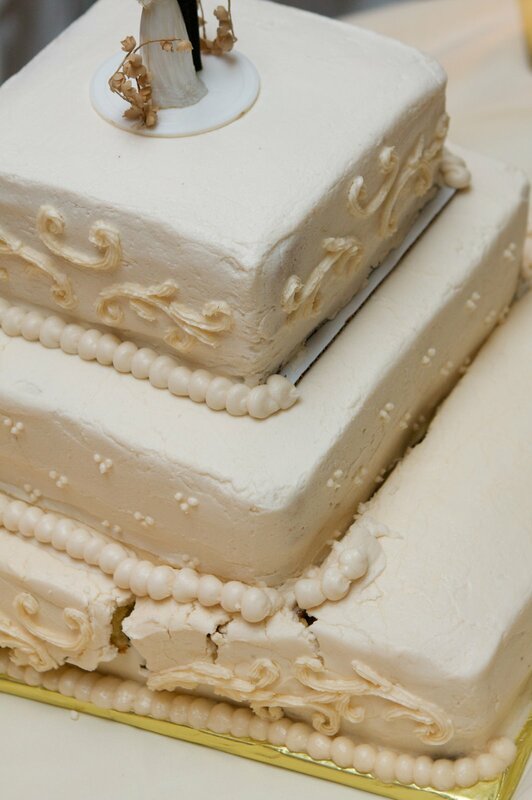 I got married in 1991 and my cake was just a minor wreck but worse, it tasted HORRIBLE. If I had a picture of it I’d submit it – I wonder if we had the same bakery (I’m in MA too). i’m so sorry about your cake! but… absolutely yes – submit it!!! i love cakewrecks, and yours qualifies. Yes, you should post on there – I love that blog!